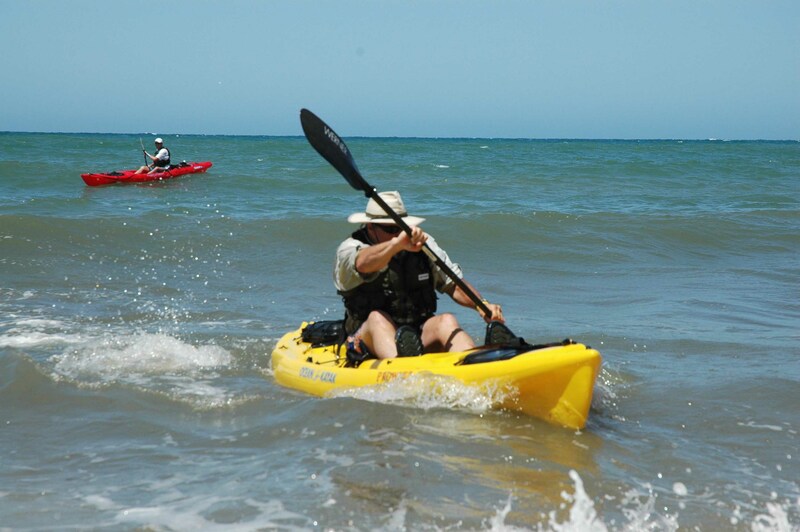 If you are not in the alternative mode of propulsion crowd, like the Hobies or Ocean Kayak Torques, to make your kayak move you are going to need a paddle. Though it seems like a very simple item there is a huge disparity between a cheap and a high end paddle. These differences can mean paddling all day in comfort or feeling like you are swinging a log and wearing yourself out. We’re going to look at the different paddle options out there, and how to choose the right one for your style of kayak fishing. First let’s break down the main components of a paddle, which are the shaft and the blades. The shaft, for the most part will be made from fiber glass, carbon fiber, or aluminum, can be one or more pieces and come in a variety of lengths. The joint where the segments of a two piece paddle connect is called the ferrule. At the most basic the ferrule will allow you to use the paddle in a straight or feathered orientation. (Feathering a paddle is the ability to offset the angle of the blades to help the blade slice through the wind) On higher end paddles the ferrule will be adjustable allowing you to fine-tune the feathering of the paddle to match your paddling style, and in some models even allow you to adjust the length of the paddle by several centimeters. In the higher end paddles you can also get a paddle with a crank or bent shaft, which much like the curling bar at the gym allows you to hold the paddle in a more ergonomic manner. I personally use a crank shaft paddle and have found that it has relieved the tendonitis I was suffering in my elbows. The Paddle I use is a Werner Kaliste you can learn more about this great paddle here. The blade, consists of the power face which is the side of the paddle blade that catches water when you take a forward stroke, and the back face which is the side of the paddle that gets used for reverse strokes. The blades can be constructed from plastic, fiberglass or carbon fiber. The blades come in a variety of shapes and sizes for different paddling styles and can be symmetrical (square) or asymmetrical (angled) at the ends. The large square blade will catch more water and give more power while an asymmetric blade will allow the paddler to use a much lighter grip, thus causing less fatigue and strain on your body over a long day of paddling. Just remember when using an asymmetric paddle the shorter end of the paddle goes on the bottom not the top. I can’t tell you how many people I see paddling around with their paddle upside down. In kayaking there are two common, yet very different, paddling styles, Low Angle and High Angle. These styles correlate to the angle of the shaft in relation to the surface of the water. Determining your style of paddling will guide you in selecting the right paddle for you. Low Angle is the most common paddling style. It is a more relaxed touring style with a slower cadence, much like you will find you are doing while slow trolling your baits. Paddles for low angle paddlers will have longer and narrower blades designed to pull through each stroke with the right amount of surface area for good power while maintaining a smooth forward stroke. This style of paddle will cause the least amount of stress on the body during long days of paddling. Because of the low angle of your stroke you will be able to take long easy strokes and will generally use a paddle from 220 to 240 centimeters. High Angle paddling is typically a more aggressive powerful style of paddling with a faster cadence than you will use as a low angle paddler. This style of paddling is more typical for kayak surfers where short bursts of power are the norm unlike the constant easy paddling of a distance paddler, which is really what most kayak anglers are doing. High angle paddles have short wide blades for a more powerful stroke and will be used in shorter lengths, 205cm – 220cm, to assist in the higher stroke cadence used in this style of paddling. When it comes to paddle length, you need to take into consideration not only your paddling style but your height and the kayak you will be paddling. You will need a much longer paddle if you are on a high dry super stable sit on top then you will need if you are fishing out of a sit inside kayak. The biggest factors dictating the quality and price of a paddle are the materials used in its construction, and the added features such as the adjustable ferrule or bent shaft. The most common paddles are made from fiberglass and plastic/nylon, because they’re durable, they’re affordable, and they perform reasonably well. The highest end paddles are made with carbon fiber. They’re extremely light, strong, and stiff, and they feel great to paddle with. Of course you pay for them. Blade shape and size is a really a personal preference. Obviously, the bigger the blades, the more powerful your strokes will be, but the more energy it will take out of you and the more stress you will have on your joints. So there you have the basics of choosing a paddle. The truth of the matter is that you can get by with pretty much any paddle, as long as it makes your kayak move and will hold up to the abuse. With that said, better paddles are lighter, they’re stronger, they let you get more from each stroke, and they really do feel a lot better in your hands. So once you start paddling more, you’re probably going to want to upgrade to a better paddle. Will a high end paddle make you a better kayak fisherman, NO, but I guarantee if you get one you will be able to paddle longer, farther and in more comfort, particularly when you want to get out on the water for several days in a row. It is very difficult to pick out a paddle just by grabbing it off a rack and holding it in your hand. I would suggest getting your paddle from a shop that allows you to demo the paddle on the water, and make sure you demo the paddle on the same kayak you will be using so you get the best feel of how your paddle will match up to your kayak. A good paddling shop will also be able to advise you on the correct paddle for you by critiquing your paddle stroke. You can also get some help picking out your paddle on the Werner Paddles web site Paddle Fit guide. Just answer the questions and it will point you to a recommended paddle. As a note, the fit guide is geared more for sit inside paddlers so you will likely want to bump up the paddle length by about 10 cm over what is recommended. Once you get that good paddle I highly recommend taking a paddling class to ensure you get the most out of your investment.